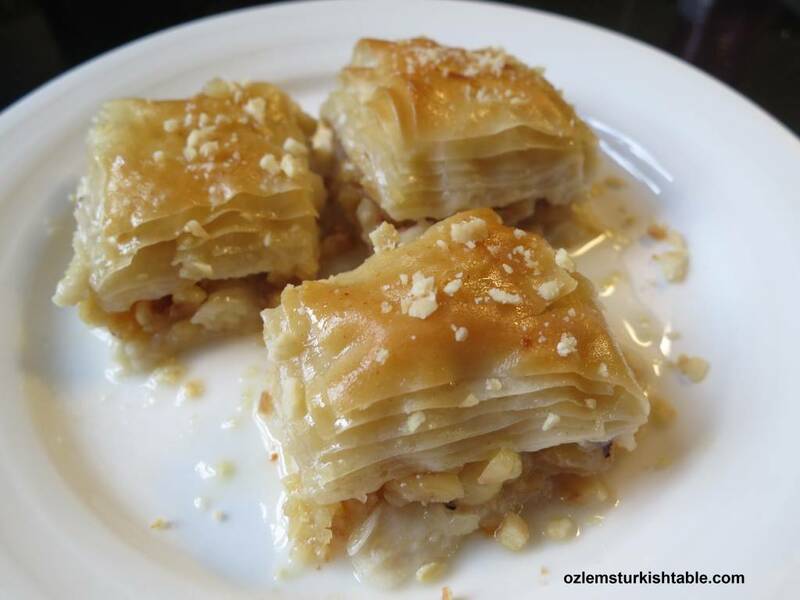 Sutlu Nuriye is a delicious Turkish dessert; similar to baklava but lighter with its milk based syrup. 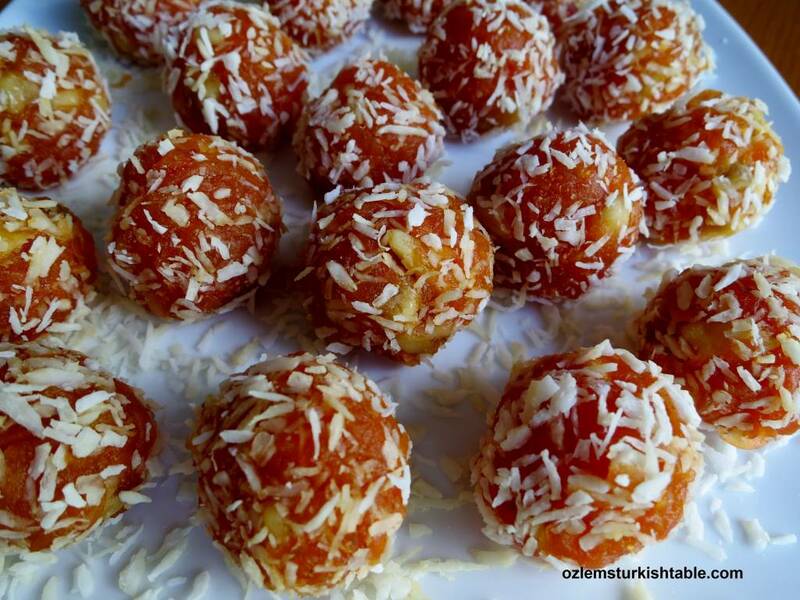 Crushed hazelnuts are used in the filling here and works wonderfully with the milky syrup, which gives Sutlu Nuriye a whitish look. Sutlu Nuriye is lighter, creamer than baklava and really easy to make at home, using filo pastry sheets. 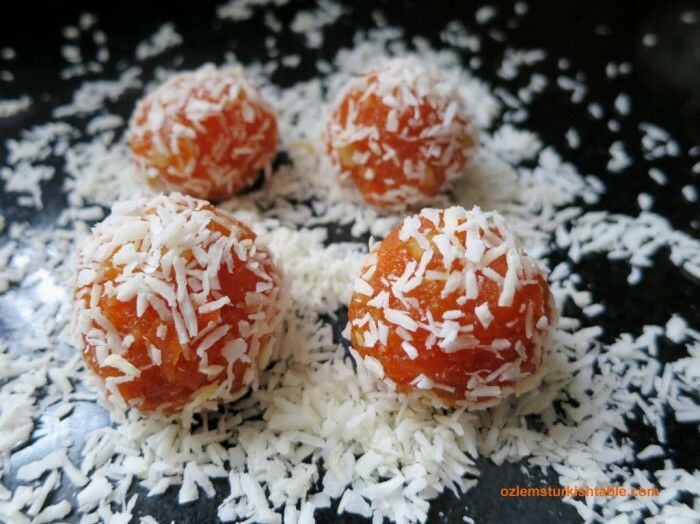 They have been a huge hit with the children, as well as adults in our home, great for entertaining. Pour in the luke warm milky syrup over cooled cooked filo pastry and let the pastry to soak the milky syrup for 35- 40 minutes. 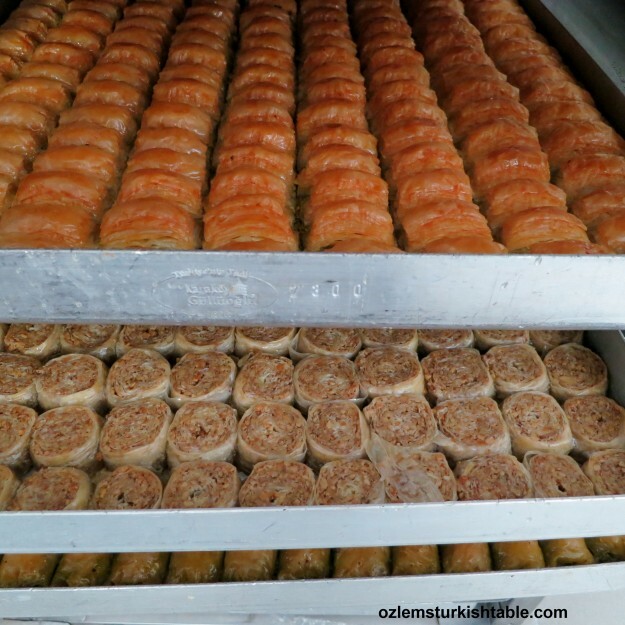 Sutlu Nuriye believed to be created due to the supply shortage in 1980s. 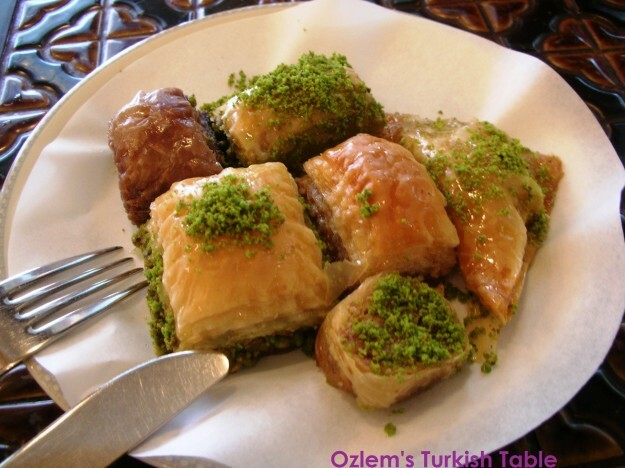 Rather than the expensive pistachios, a baklava producer used hazelnuts and flavored with milk for lighter syrup. 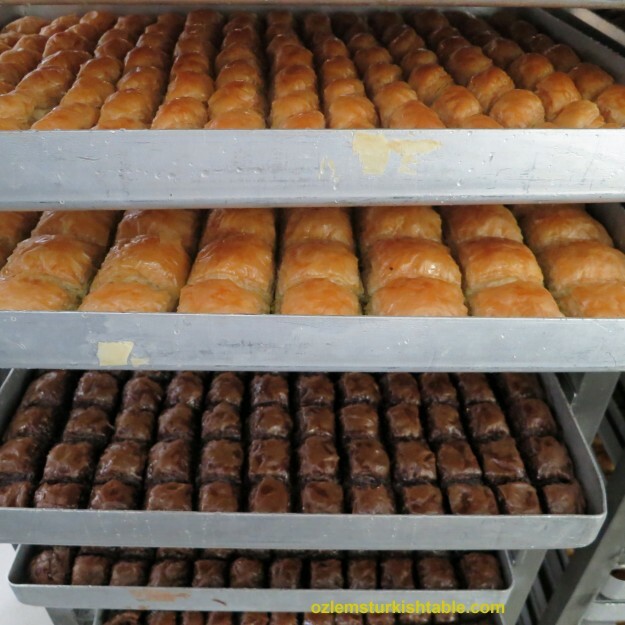 The result has been today’s popular Sutlu Nuriye, a delicious, lighter version of the regular baklava. Light, melt-in-the mouth Sutlu Nuriye, a variation of baklava in milky syrup. 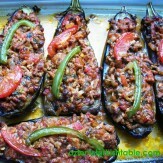 You can prepare Sutlu Nuriye a day ahead of time and keep it in a cool place; always serve at room temperature. 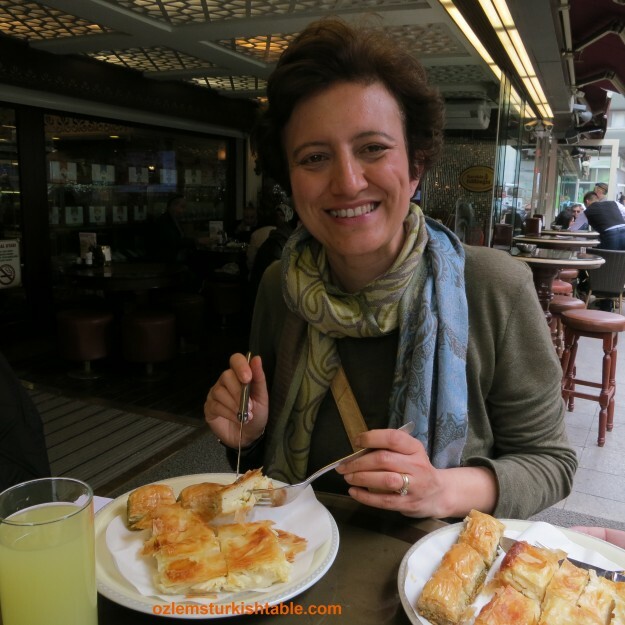 I hope you enjoy this soft, light, melt-in-the mouth Sutlu Nuriye, a variation of baklava in milky syrup. 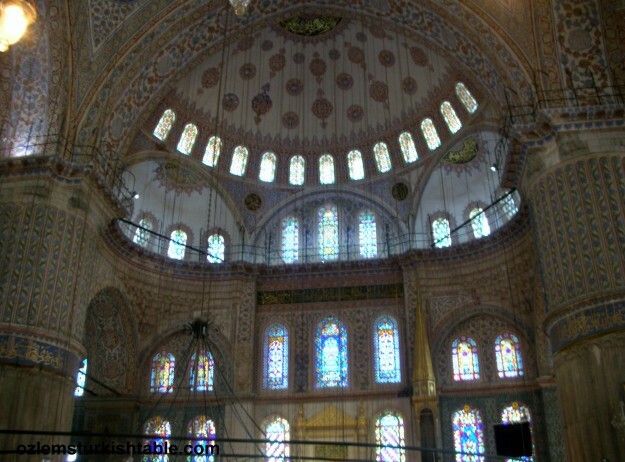 Turkish coffee or Turkish tea, cay aside complements Sutlu Nuriye very well. My very best wishes to you all for the festive season. 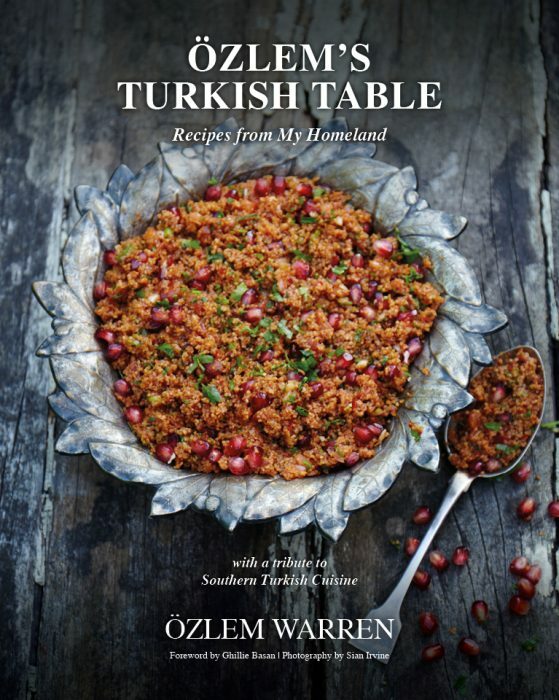 Many thanks for your company, recreating my Turkish recipes at your homes, your kind share and comments, I greatly appreciate it. 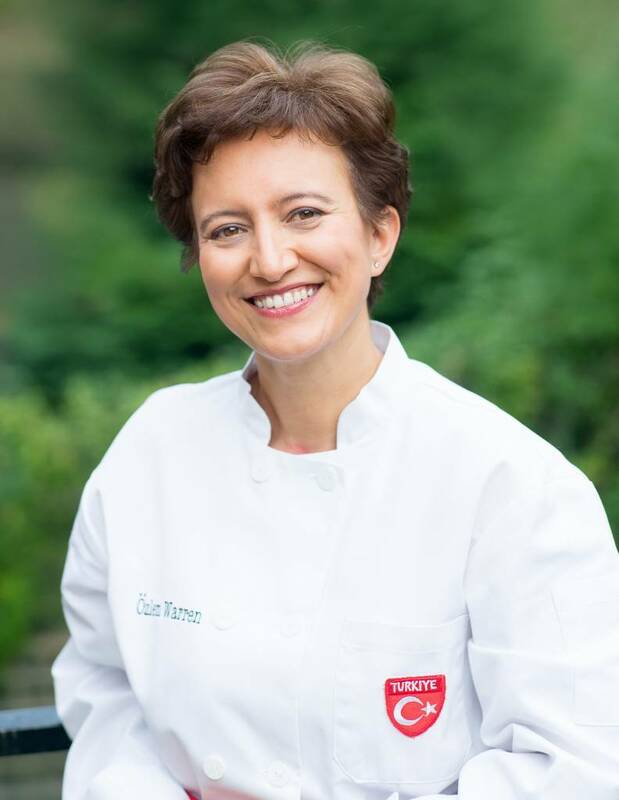 It’s been a pleasure enjoying Turkish cuisine with you all and I look forward to sharing many more recipes in the New Year. 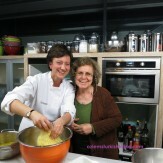 I wish you all a happy, healthy new year in good company and delicious food. Sutlu Nuriye is a delicious Turkish dessert; similar to baklava but lighter with its milk based syrup. Crushed hazelnuts are used in the filling here and works wonderfully with the milky syrup, which gives Sutlu Nuriye a whitish look. 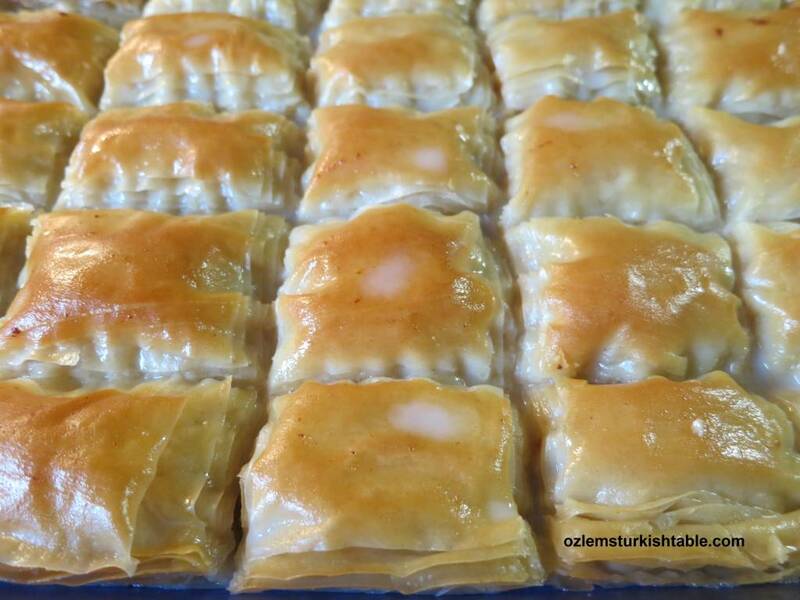 Sutlu Nuriye is lighter, creamer than baklava and really easy to make at home, using filo pastry sheets. 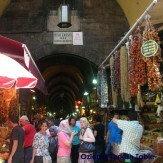 Hope you enjoy it, Afiyet Olsun! 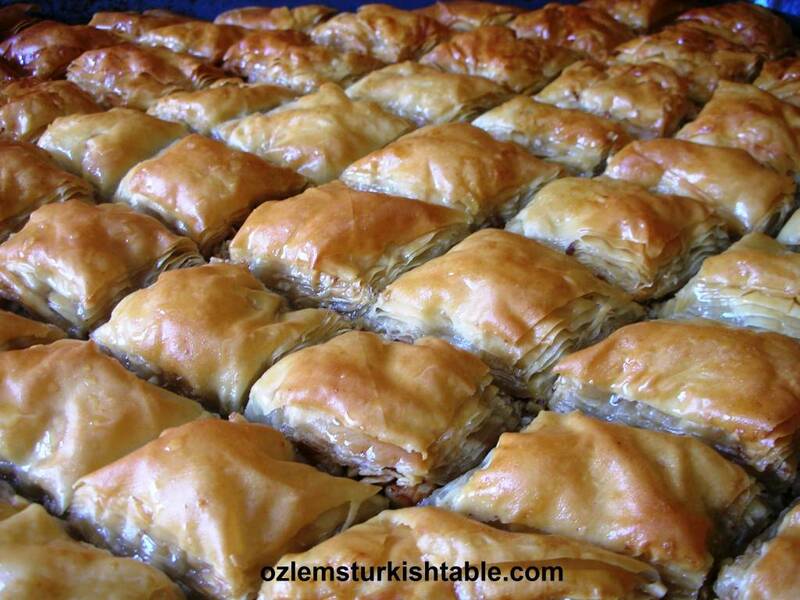 Take out the fresh filo pastry sheets from the fridge and bring to room temperature 20 minutes prior using. To thaw frozen filo sheets, it is best to place them in the fridge the night before or bring it to room temperature 2 hours before using. Grease the baking dish with the melted butter. Place two filo pastry sheets to the baking dish (trim the sheets at the edges if necessary to fit into your baking dish) and brush with the melted butter. Place 2 more filo pastry sheets and brush with the melted butter. Place another two sheets over them and brush with melted butter. Crush the hazelnuts in a food processor, carefully pulsing a just few times or chop by hand (take care for the hazelnuts not go too small pieces or fine). 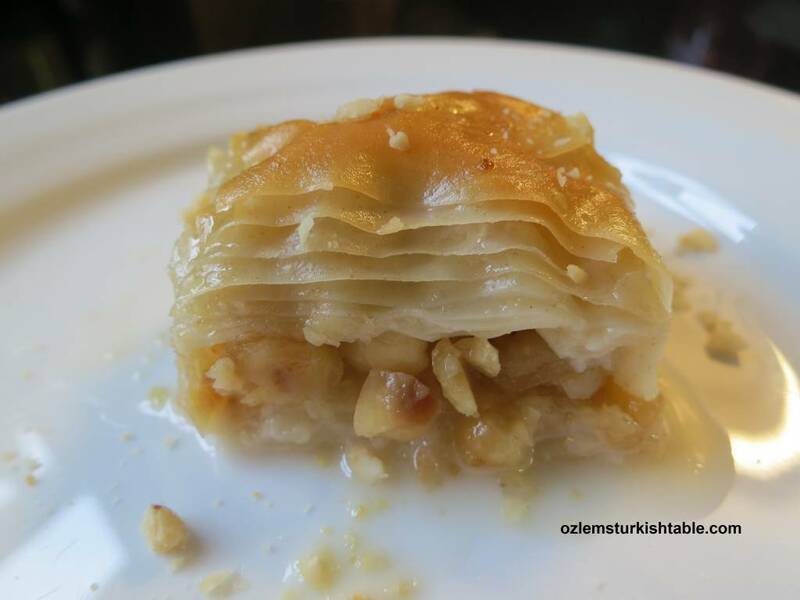 Spread the chopped hazelnuts evenly on the 6th sheet of buttered filo pastry. Lay two more sheets of filo pastry and brush with melted butter. Repeat this 2 more times, buttering every two sheets, until you reach 12th sheet. 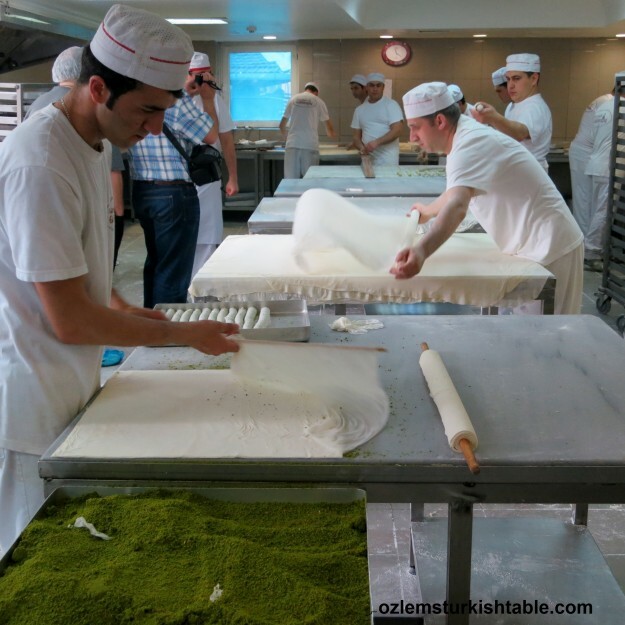 Brush the 12th sheet of filo pastry with butter and ease the sheets into the corners and trim the edges if necessary. 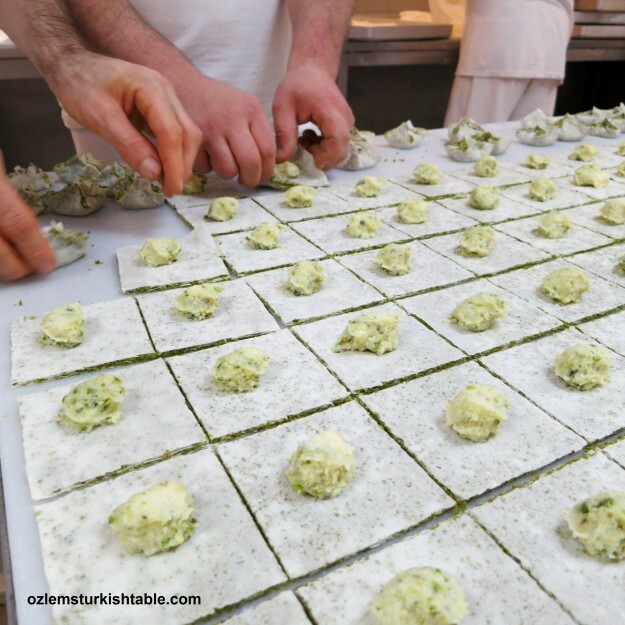 Then using a sharp knife, cut right through all the layers to form small square pieces. It should make about 30 pieces in total. Bake the pastry in the preheated oven (180 C/ 350 F) for 25 minutes, until golden at top. While the pastry is baking, prepare your syrup. Put the sugar into a heavy pan, pour in water and bring to the boil, stirring all the time. Once the sugar is dissolved, lower the heat and simmer for 10 minutes. Pour in the milk to the pan, give a good stir to the syrup and turn the heat off. Leave the pan aside to cool down; the syrup needs to be luke warm to pour over cooked filo pastry. Once the filo pastry is cooked and golden at top, take out of the oven and leave it aside to cool down for 15 minutes. Slowly pour in the luke warm milky syrup over cooled cooked filo pastry and let the pastry to soak the milky syrup for 35- 40 minutes. 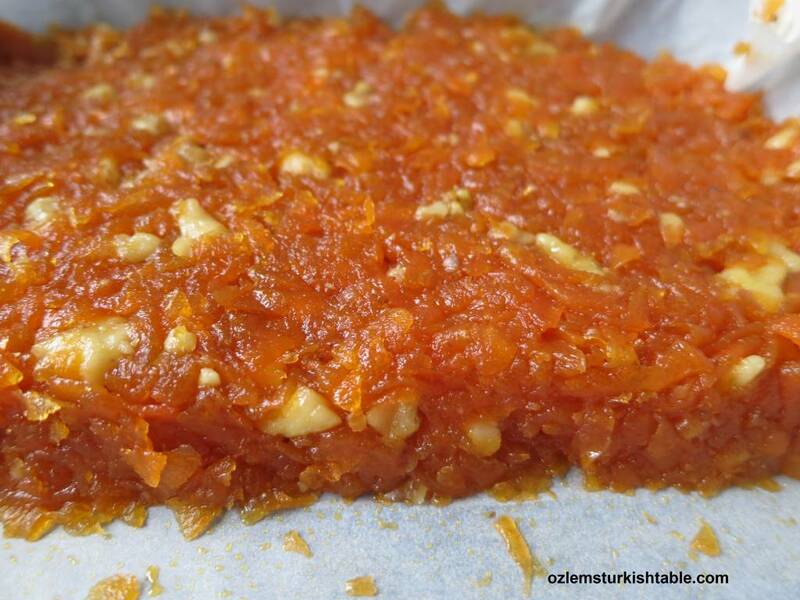 Once milky syrup is absorbed by the pastry, take out the Sutlu Nuriye squares and serve at room temperature. 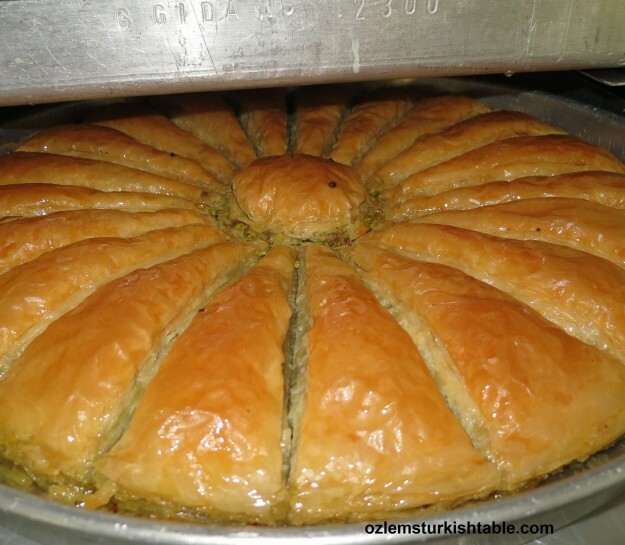 You can prepare Sutlu Nuriye a day ahead of time and keep in a cool place, covered.